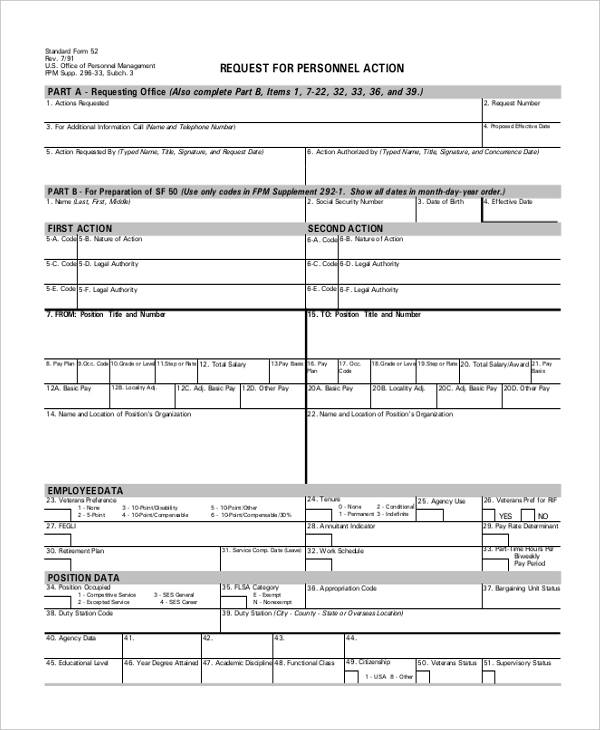 This Request for personnel action form template is suitable for companies who want to keep a record of actions taken on employees from the HR department. Just download and use it. 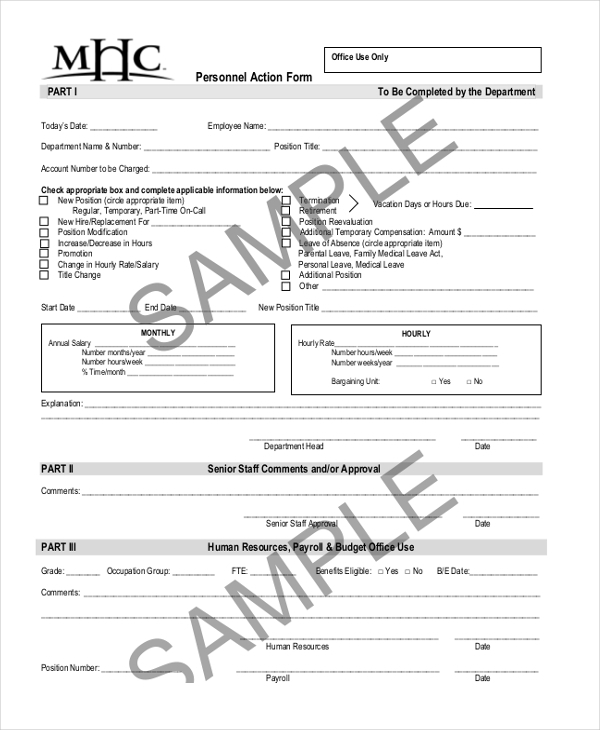 For HR departments, this Sample personnel action form template is a must download for recording termination or change of job position and other actions taken on employees. Customize, print, and use. 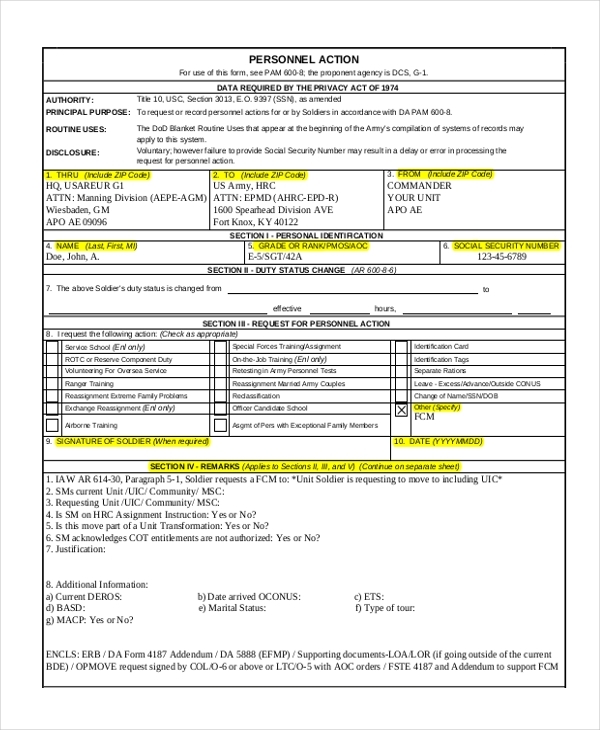 Personnel action Form army should be downloaded by military organizations for carrying out and recording actions taken on the soldiers, like transfers or amendment in titles. Print it after customization. You can also see Employee Action Forms. For recording transfers, job position change, new recruitments or every other action in the HR department related to employees, this Personnel action notice form should be downloaded. Edit, Print and use. Universities or any other educational institutes can download this Personnel action form free template for recording the actions taken against the job position changes of their employees. Customize and use. 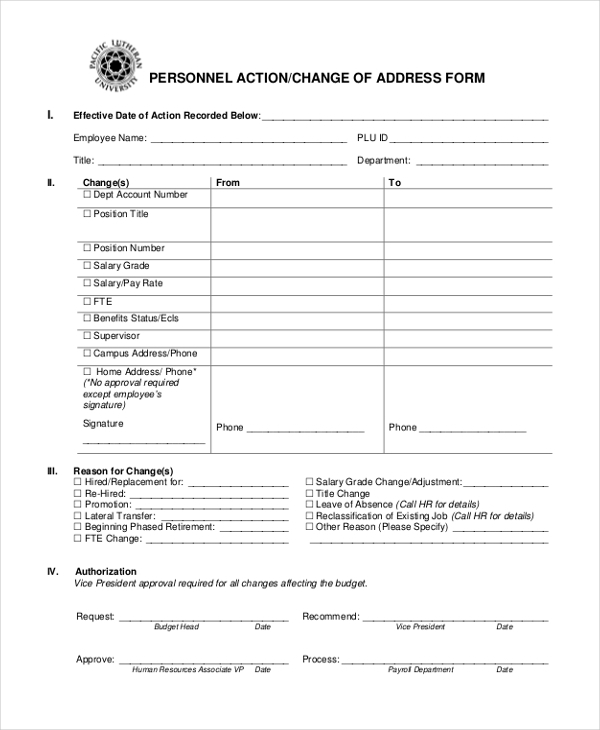 This personnel action change of address form is perfect for the HR department of universities who wants to keep a track on the actions taken by their employees. Download, customize and use. Any business organization can download this advice of Personnel action form template for use of their HR department in keeping a record of their employees who will retire. Customize, print, and use. 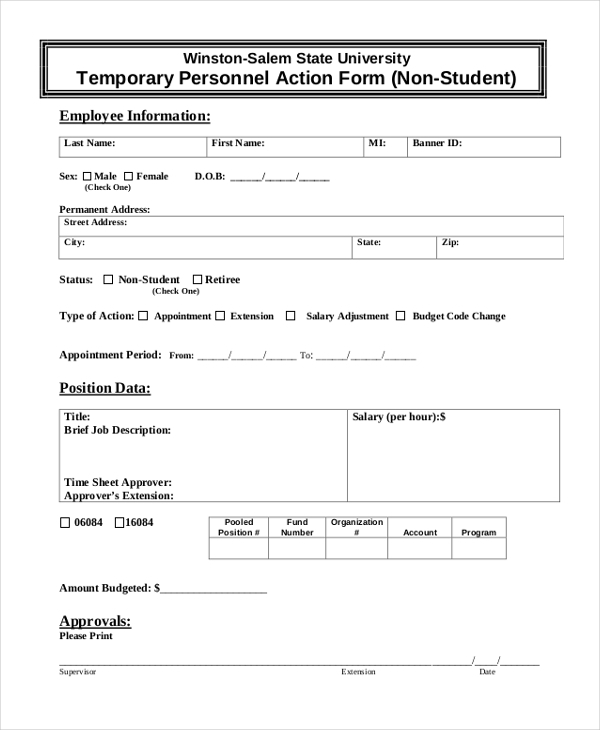 For keeping information of employees by the HR department of a University or any educational institute, this Temporary Personnel action form template can be of good use. Download, edit, and use. you can also see Affirmative Action Forms. 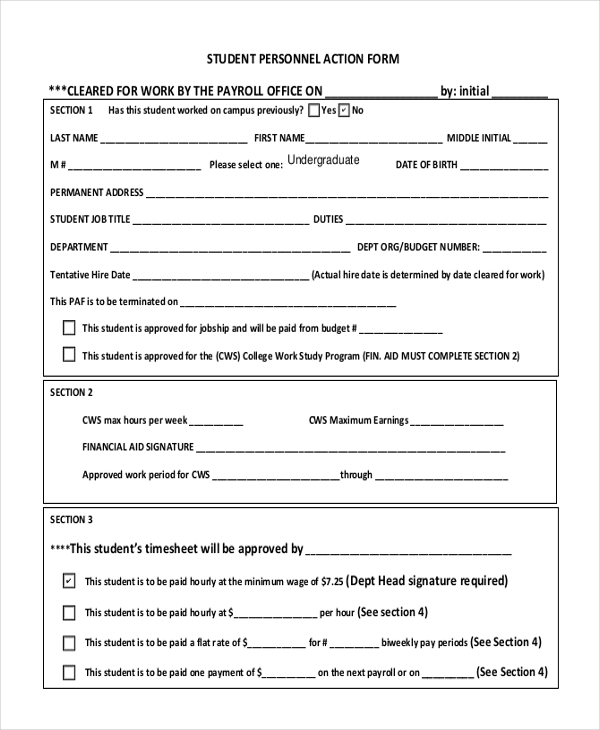 Universities which hires their students for work can use this Student personnel action form for keeping their action records in their HR department. Just customize after download, then print for use. Usage of Personnel Action Form? A form called Personnel Action Form (PAF) has to be prepared for keeping a proper action record of an employee working in any organization. The Human Resource (HR) department of the organization has the responsibility of keeping this form updated by recording actions such as the hiring of a new employee, transfer or termination of an employee, increase and decrease in salary or wages or any sort of job title change of those employee’s . The Personnel Action form templates found in our collection makes the job very easy and are a must download. you may also see Corrective Action Forms. Target Audience of Personnel Action Form? 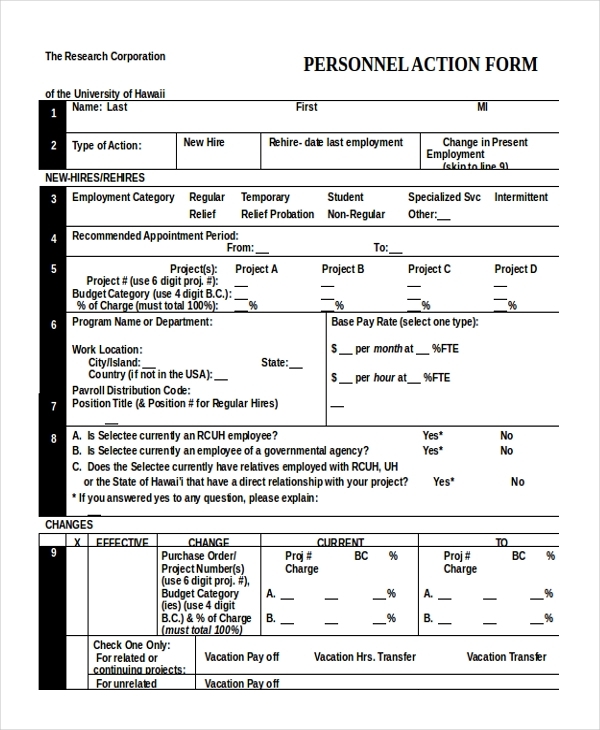 Any institute or organization, which has a proper Human Resource department, can download these Personnel Action Form templates. This is very helpful as it can stay as a proper record of an employee’s tenure in a particular organization. Whenever a change in action is taken against that particular employee that can be updated in this form. This can make the workplace more organized, and whenever needed can be produced easily for references. These templates are mainly available in PDF and Microsoft Word formats and they are fully customizable, just print for use. 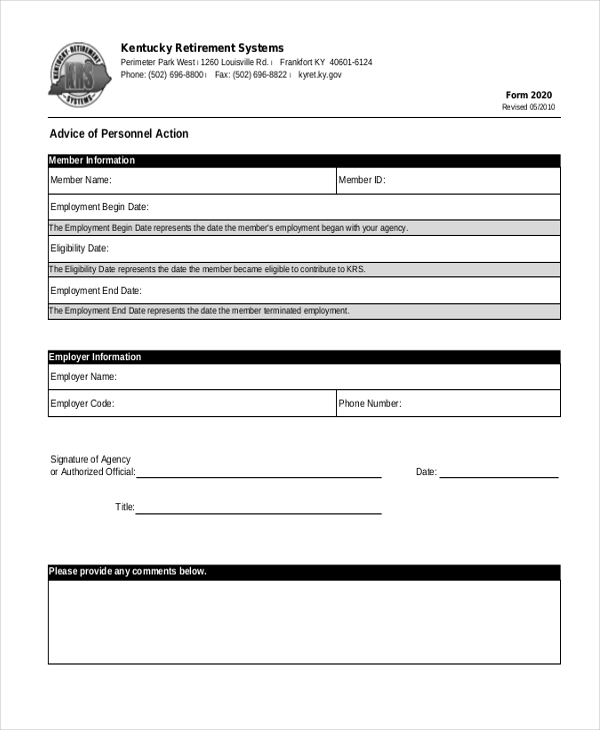 Browse through our entire collection for getting your Personnel Action form template for free. These templates have been designed by experts and have a very professional and smart look, which is a fit for every industry. Just go through them and pick the appropriate one and download in your system for use. You can also see Disciplinary Action Forms.